The Liquid Sound Table is our most popular product. Please checkout the Reviews on the Review Tab. PBS Documentary (March 2019) - POWER OVER PARKINSON’S 2 - https://cptv.org/power-over-parkinsons-2/ - Part of this documentary features Vibroacoustics as one of our Liquid Sound Tables, VAT Frequencies and VAT Music are used with a person with Parkinson's who surprises herself with what has been accomplished in 3 weeks of VAT Therapy. Created for YOU in the USA using US grown hardwood. 2 or 3 High End New Technology Transducers positioned using Sacred Geometric formula, as we have done with all of our Sound Tables since we started creating them in the 1990's. Our original setup with 2 transducers works very, very well since the liquid transmits the vibrations quickly and efficiently. After numerous requests for a 3 transducer model, we have developed an excellent 3 transducer model as well (add $550). Weight: Table without Water and Hydraulic Lift: 70 lbs. o Table with Hydraulic Lift: 96 lbs. Choose from the Pain Management, Human Body, Muscle & Structural or Energy and Balancing Series of VAT Frequency CDs. o Our Conscious Flight, Deep Inner Peace and Inner Alignment Vibroacoustic Music CDs (VAM) are also included. Sound Tables need an amplifier (included) and a sound source (or two) such as a CD player, Ipad or other tablet, Ipod or mp3 player, Iphone, Android phone, laptop or desktop computer, etc. Your Liquid Sound Vibroacoustic Table allows you to feel the sound throughout your body as well as producing audible sound which wraps around and cocoons you. It does not have to be loud for you to feel it (although it can be loud if you like). The setup can be as simple as your Sound Table, an amplifier and an Ipod. Your system can grow over time. Headphones, while not necessary, can be used to isolate you when you are on the Sound Table - so you aren't interrupted. A Stereo or Surround Sound system may also be used in conjunction with your Sound Table. We have experience with many different configurations and will share our expertise, if you ask. ----- A mixer allows for any music to be mixed with VAT (Vibroacoustic Therapy) Frequencies. It allows you to control the level of the frequencies as well as the level of of the music. It also allows for headphones to be used for music while music and frequencies are playing in your Sound Table. Audio Packages available in US and Canada only due to 120 voltage. Sound Tables are not voltage dependent and will work worldwide. If outside the US, we can recommend to you where to purchase the proper audio equipment locally. We have always used Oak with a natural finish - that is our standard table base. We create these for you after you order, here in Niagara Falls, NY - we can work with you. Shipping to continental US destinations included. Inside delivery available at added cost. Personalized installation and training by Stephen Deuel may also be available. Please contact us regarding shipping outside the Continental US. All of our Vibroacoustic Liquid Sound Tables are custom built for You. Please allow 5 – 6 weeks for us to create your Liquid Sound Vibroacoustic Table. Creating the InnerSoul Liquid Sound Table - Stephen Deuel, Managing Director of InnerSoulutions LLC - www.vibroacoustic.org and www.InnerSoulutions.com - Talks a bit about his start in Sound Healing in the mid 1980s, motivation, Vibroacoustics and VIbroacoustic Therapy - or VAT - and delight that he is able to pursue right livelihood in a way that "Let's his Heart Sing". Workmanship on the table is excellent, nice looking and very sturdy. Setup was not difficult and it has been wonderful trying out all the different treatments, including some of my own creations. It is like taking a bath in sound, the best way I have found so far to really experience sound vibration. The liquid sounnd table is solid and well built product. I am very pleased with the quality and the construction materials. This is the second table I bought from the company. I also have the portable folding sound table with which I am very happy. In addition, I am extremely grateful to Stephen as right after I ordered and paid for the table, I had a finacial disaster and could not finsh the home I was constructing where I was going to use the table. The company held on to the table for two years until I could get back on my feet again and have a roof to put it under. That is true customer support! I received my Tranquility Liquid Sound Table™ about a month ago and cannot begin to express how pleased I am with this product! This table really takes the Vibroacoustic experience to a whole different level. For many years I had been using one of Stephen’s portable mats on a massage table and was able to provide a good quality experience to my customers. As a Vibroacoustic practitioner I have had the opportunity to try a wide variety of products and have always found Stephen’s products to be far superior to anything else on the market. The vibro-tactile input of Stephen’s products is always “clean” which improves the therapeutic benefit and enhances the overall mind/body experience. The individual care and quality workmanship Stephen offers is second to none. A few years ago when I attended a workshop with Stephen and Deborah, I was able to try out the Tranquility Liquid Sound Table™ and was hooked. But it took a few years for it to work into the budget. Now that it has, there is no looking back! As a Neuroplastician and Naturopath, I thoroughly appreciate the neurological and physical benefits of the more accessible vibro-tactile input that is available with the Tranquility Liquid Sound Table™. As an energy practitioner, I revel in having the water of the table as a resonant assistant to my work. It has definitely expanded what I am able to do energetically during sessions. 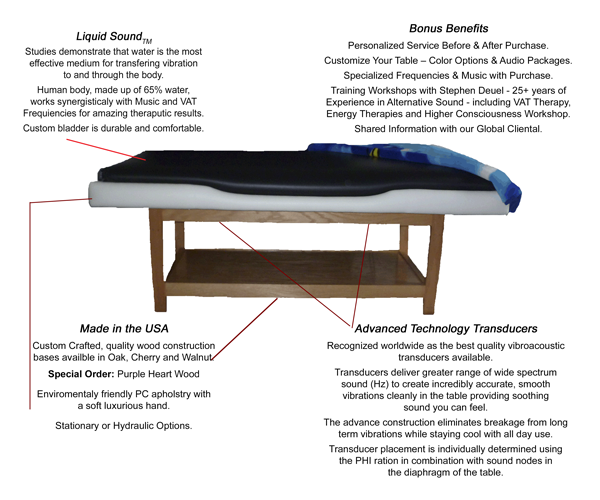 I would highly recommend the Tranquility Liquid Sound Table™ from Inner Soulutions. In my opinion it is the premier Vibroacoustic tool for anyone wanting to offer (or personally use) this wonderful and unique healing modality. I'm a Naturopathic Doctor practicing for 18 years. The benefits for my clients and myself have been life changing. Similar to homeopathic theory, the right vibrational frequency can be a catalyst for self-healing. Easy to use with powerful results. It sells itself with relaxation, comfort and connection to self. I love it and will thankfully be able to share the table for years to come. I set up the table at my clinic and I tried a session. I felt wonderful after the very first 30 minute session. More alive,vibrating, I feel it has increased my vital energy. All of my patients love it, it is easy to love with the experience of relaxation from vibrations. Some comments: "I am SO relaxed". "My neck pain is gone", "I am not as stiff as usual". I look forward to the long run, the health changes after several sessions. I've had it one month now. I've had my liquid sound table for about a month now . It's wonderful! So much thought has gone into every detaiil--from the quality of the materials, the construction and also the packaging. It's just as you said Stephen--detailed instructions, so no problem in getting it set up. Thank you for your immediate responses to my emails!. I am now experiencing the many healing benefits of using the table on a regular basis and exploring the many ways it can help my clients in their healing journey. Thank you--it's obvious that you have a love and passion for this uniquely magnificent product. Very impressed with Stephen and the quality of the product. He kept me informed during the entire process and has responded to my every question in a timely manner. The bed couldn't be any better. After only a few days of use I've noticed significant improvement in muscle tension/spasms in my back and shoulders. "I have not been able to lay on my back or stomach, even to sleep, for more than 5 minutes for years. My massage therapist, Trisha, A. asked me to come and try the Sound & Water Table. She ended up being able to do body work on me for 45 min on my back and 45 min on my stomach. "The one that sent me over the top was their new InnerSoul Tranquility Sound & Water Table.